Rose Barn01263 715779work01603 870304fax Self-cateringRose Barn, a converted barn on one level, is situated in the village of Billingford in North Norfolk. The property offers a good location from which to explore the market town of Reepham, the nature reserve of Pensthorpe, the coastline with its sandy beaches, fishing towns and nature reserves, and Fakenaham with its racecourse, cinema and interesting shops. The cathedral city of Norwich is a half hour drive away. • Other: Bed linen, towels, woodburner starter pack provided; further log supplies can be bought. Babysitting may be available. 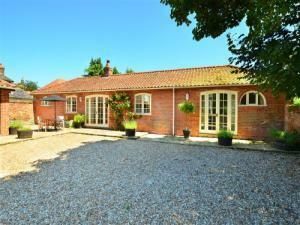 Rose Barn, a converted barn on one level, is situated in the village of Billingford in North Norfolk. The property offers a good location from which to explore the market town of Reepham, the nature reserve of Pensthorpe, the coastline with its sandy beaches, fishing towns and nature reserves, and Fakenaham with its racecourse, cinema and interesting shops. The cathedral city of Norwich is a half hour drive away.